Hocking Hills Roasters: Coffee in the Hills! 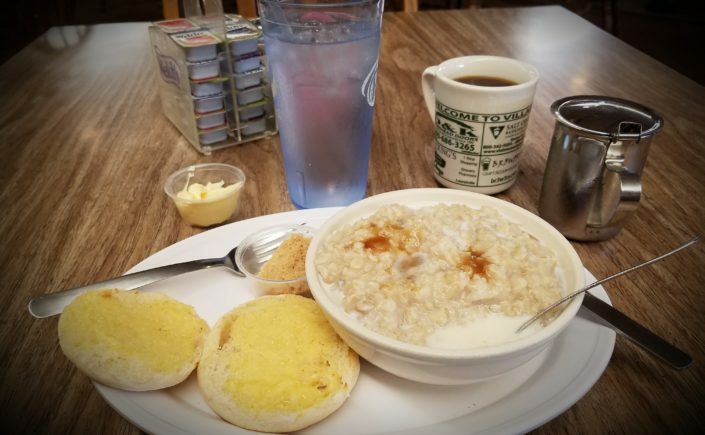 Hocking Hills Roasters is just one more reason to visit Hocking County, and it’s a particularly wonderful place to go when you want some indoor things to do (or when you’re worn out from all of the outdoor things). It’s located in the Hocking Hills Market on U.S. 33, south of Rockbridge. In two words: fabulous coffee. Dave and I, and our friends Sherwin & Diane, made a stop there recently, to pick up some Ethiopian Limu coffee, roasted on site, and accidentally learned how to make a really good cup of coffee using a French press. The owner, Roger Varner, mans the shop on the weekends and he knows his stuff. He is very gentle about “adjusting” your ideas about how to make coffee. We have now learned from the master! Hocking Hills Roasters also offers roasted nuts, fudge, Get Well teas and the largest, tastiest turtle (candy) I’ve ever had. Seriously, go there for coffee, but get a turtle too. The Ridge Inn: New Restaurant in Laurelville! There is a GREAT new addition to dining in Laurelville: The Ridge Inn. My friends Beth, Beth, Kathy and new friend Pat met there for lunch today. I had the cusabi chicken salad and crab chowder. Crab chowder in Laurelville?! Both were wonderful. The salad included diced chicken, pecan pieces and dried cranberries tossed in cusabi dressing, a light cucumber flavor, and was served over mixed greens. The crab chowder was so good I ordered some for take-out – my Dave is sure to love it tonight for dinner. Everyone enjoyed their lunch, including really, really good coffee. Kathy & Pat ordered hot tea and got to pick from a selection of very fine teas from Harney & Sons. Beth and I had biscotti for dessert, and Beth had a muffin. So far, the Ridge Inn is only open for breakfast and lunch, Tuesday through Sunday. But they are planning their grand opening for next week and then will start serving dinner. The lunch menu includes hamburgers, cusabi chicken sandwich, grilled cheese sandwich, chicken salad sandwich, the Ridge salad and the cusabi chicken salad. They also usually have 2 soups and 2 specials. The building is brand new and the ambience is very fresh and modern. Since very few new buildings and businesses are ever added to the Laurelville village proper, this is a bit of a shock. But the design fits in.Almost all of the tables are near windows. Plus the second floor has a meeting room that can be reserved. My friends and I HIGHLY recommend the Ridge Inn. P.S. I need to ask the owner why she named it “The Ridge Inn” when it is most definitely NOT on a ridge! My girls (Beth, Kathy & Julie) and I had our monthly lunch at the Inn & Spa at Cedar Falls on Monday. They offer yummie soups, salads & sandwiches, plus desserts on their lunch menu. I had the 1/2 a sandwich/bowl of soup combo for $8.00 (excellent chicken salad), then shared an incredible brownie & oatmeal-raisin cookies with Beth. It’s a little pricey but the high quality and rustic/cozy ambience make it all worthwhile. Plus you’re only moments away from Cedar Falls, if you’d like to take a little hike before or after lunch. If you are staying at Marsh Hollow, the Inn & Spa is a 25 minute drive. Or if you’d prefer in-cabin massage therapy and spa services, we recommend Blue Valley Massage.